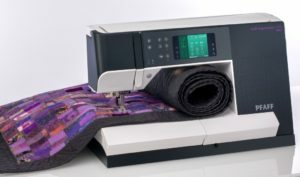 Elegant functionality is delivered with poise and precision by the exciting PFAFF® quilt expression™ 720 sewing machine. Discover the depth and harness the artful ability of this sophisticated and robust machine. 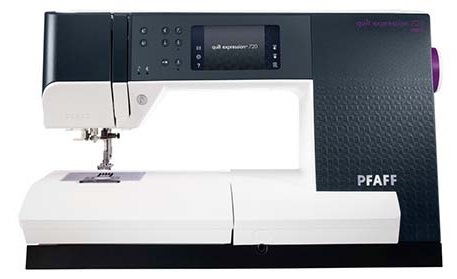 Large Sewing Space – The PFAFF® quilt expression™ 720 sewing machine is the perfect choice for quilters, home décor sewers, fashion enthusiasts – just about anyone who loves to create. The sewing area from the needle to the right is just under 10″ (250mm), perfect for sewing large amounts of fabric or batting or fabric with batting. PFAFF® Color Touch Screen – See the stitches in real size and get all of the sewing information you need directly on the Color Touch Screen! The Graphical User Interface is specially designed to meet your needs. Exclusive PFAFF® Stitch Techniques – Experience world class, unique and advanced stitch techniques for sophisticated design. 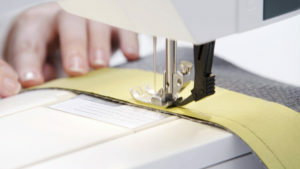 Floating Stitches – add embellishments to your project with stitches that look like they are floating on top of the fabric with no connecting stitches in between them. It looks like a unique hand stitched effect. Triple, Double and Single Ribbon Stitches – add dimensional elements to your decorative stitching with beautiful ribbon stitches, Narrow ribbons and trims are woven into these special stitches as you sew. Stacking Stitches – sew beautiful decorative stitches in two colors. The stacking stitches consist of pairs of stitches designed to be sewn on top of each other, one at a time. Exclusive Stitch Creator™ Feature – Create 9mm stitches or edit built-in stitches for unlimited creativity. Just think of all the possibilities! Automatic Self-Adjusting Thread Tension – Best tension is set automatically for all sewing techniques and fabrics! You can override automatic tension easily for specialty techniques. Maxi Stitches – Add beautiful decorative accents to your projects with stitches and monograms that sew side to side to create finished stitches up to 52mm wide. Free-Motion Mode – Choose between 3 modes for free-motion quilting, thread painting or darning. The feed teeth will drop automatically when your preferred method is selected. Automatic Presser Foot Lift – Raise the presser foot instantly when the needle is set to stop down. 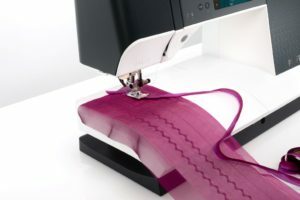 Sensormatic Buttonholes – The Sensormatic Buttonhole Foot automatically sew perfectly balanced one-step buttonholes every time. Both buttonhole columns are sewn in the same direction for precise stitch quality. 10 buttonholes styles designed for various sewing applications. 37 Needle Positions – For exact placement of your straight stitch. Perfect for top-stitching, edge stitching, under stitching, stitching in the ditch or quilting. 4 Built-In Sewing Fonts – Choose from 4 sewing alphabets, with both upper and lower case letters, for easy programming. Thread Snips – Automatically cut top and bobbin threads, pulling top threads to the back side of the fabric. Stitch Restart – Return to the beginning of a stitch or sequence without having to reset any special adjustments you have made. Immediate Tie-Off – When pressed the PFAFF® quilt expression™ 720 will tie-off and stop automatically for a quick and easy finish. 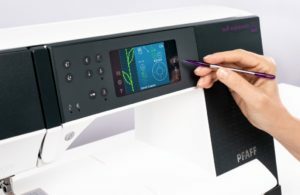 Straight Stitch Plate and Sensor – The perfect help for straight stitch sewing with any straight stitch accessory. Attach the Straight Stitch Plate and the machine sensor alerts you if you select any stitch other than a straight stitch. No need to worry about damaging your needles, machine or sewing foot anymore! Personal Menu – Save your personal stitches and sequences to sew them again whenever you wish. LED technology and light guides provide excellent lighting on your work area. See fabric and stitches in true color with little to no shadows. Bobbin Thread Sensor – Alerts you when your bobbin thread is low. It’s your decision to play “thread chicken”. Electronic Knee Lift – Raises presser foot with an easy movement, allowing you to keep your hands on your project. Speed Slider – Adjust sewing speed with the speed slider for full control. If you are a “lead foot driver” you can put your foot, pedal to the metal, and sew at an appropriate speed for your project. Updateable – Download the latest program version from the internet – update quickly with a USB stick. Languages – Choose from 12 languages in the Settings menu to a make sure your PFAFF® quilt expression™ 720 sewing machine speaks the same language as you. Inch/cm Ruler on the Base Plate – Convenient measuring directly on your PFAFF® quilt expression™ 720 sewing machine. Straight Stitch Plate – with a single hole for more precision and control. Hard Cover – Protect your sewing machine when transporting it. Dust free storage for your PFAFF® quilt expression™ 720. 5A Sensormatic Buttonhole Foot – When connected to the machine, the buttonhole is sewn in the length that has been entered into the machine. 5M Manual Buttonhole Foot – is used for sewing manual buttonholes. Use the markings on the foot to position the garment edge. The finger on the back of the foot holds cording for corded buttonholes. 6A Sensormatic free-motion Foot – is used for free motion sewing. This foot can also be used for darning. 8 Maxi Stitch Foot – is used for side motion stitches. ¼” Quilting Foot with IDT™ – is perfect for piecing and patchwork, especially when used in conjunction with the straight stitch needle plate. The distance from the needle to the outer edge of the right toe is ¼” (6mm). The distance from the needle to the inner edge of the right toe is 1/8″ (3mm). Drop in for a consultation.